An Ancient lake basin in northern Tanzania, the Olduvai Gorge has yielded the remains of more than 60 hominids as well as the two earliest stone tool traditions ever found (Oldowan and Acheulian). The gorge was discovered by German entomologist Wilhelm Kattwinkel in 1911 when he fell into it while chasing a butterfly. This inspired Hans Reck to lead an expedition there in 1913 but his work was ended by World War I. Excavations of Olduvai began in 1931 by Lois Leakey and his wife Mary. Three separate species of hominids have been found at Olduvai over the years, including Australopithecus boisei, Homo habilis and Homo erectus. Animal remains have also been found at the site including large antelopes, elephants, hares, guinea fowl, giraffes and hipparions (extinct three-toed horses). 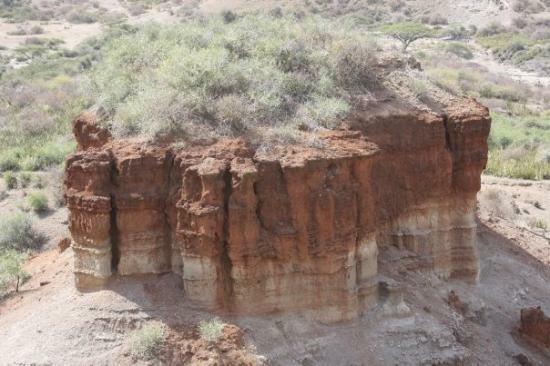 The Olduvai Gorge contains the longest sequences of cultural remains ever found and the discoveries there have strengthened the argument that the origins of humanity are in Africa. These finds also give us an insight into how these hominids lived. For example, Mary Leakey found hominid footprints in 1975, which proved that they walked on two feet- one of the greatest paleoanthropological discoveries of the past century.